Arlington, VA – Americans for Prosperity (AFP) today announced the start of a major campaign that will hold Republicans and Democrats accountable for their records on wasteful spending and thank champions who have stood up for taxpayers. 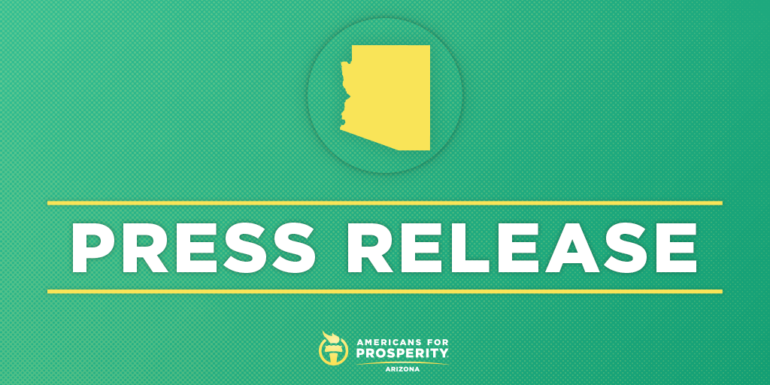 AFP has targeted one Arizona representative in the campaign, Representative Tom O’Halleran. As the nation’s leading grassroots advocate for economic freedom, AFP’s Stop Overspending, or S.O.S. campaign, will kick off during the Memorial Day congressional recess with a significant six-figure radio, print, digital and direct mail effort targeting House lawmakers on spending – specifically their support for the $1.3 trillion March omnibus package – while they are home in their districts. The first wave of this campaign will also include ads thanking lawmakers who opposed the package because of its reckless spending. The effort will feature a video and website, www.StopOverspending.com, educating the American people about the importance of reducing excessive and out-of-control federal spending and urging them to tell lawmakers to control Washington’s spending addiction. The recent $1.3 trillion omnibus spending bill pushed total Washington spending above $4 trillion for the first time and failed to make any reforms to entitlement programs, which are the major drivers of the national debt. While tax reform was a win for hard-working Americans, AFP has long-advocated the importance of pairing tax cuts with spending restraint to grow the economy and improve the lives of all Americans. Fiscal year 2019 spending legislation, which will be considered later this year, will be the last chance for members of Congress to prove before the midterm elections that they can be trusted stewards of taxpayer dollars. AFP views the Fall spending debate as a critical test for lawmakers and will be engaging grassroots activists throughout the summer to hold both parties accountable for reckless spending and stress the importance of getting spending under control. In recent weeks, AFP has fought major boondoggles like the 2018 Farm Bill and called on lawmakers to repeal some omnibus bill spending by supporting President Trump’s rescission plan. Representative O’Halleran has been an outspoken advocate for fiscal responsibility.